"India… a young country, a timeless civilisation Explore it with India’s very own storyteller, Amish India, a culture that witnessed the dawn of civilisation. That witnessed the rise of other cultures and watched them turn to dust. It has been celebrated and attacked. Admired and vilified. But through all these millennia, after all the ups and downs of history, it’s still here! And now, after a few centuries of decline, it’s driving a new dawn once again. Ajanaabhavarsh. Bharat. Hindustan. India. The names may change, but the soul of this great land is immortal. Amish helps you understand India like never before, through a series of sharp articles, nuanced speeches and intelligent debates. Based on his deep understanding of subjects such as, religion, mythology, tradition, history, contemporary societal norms, governance, and ethics, Amish lays out the vast landscape of an ancient culture with a fascinatingly modern outlook." 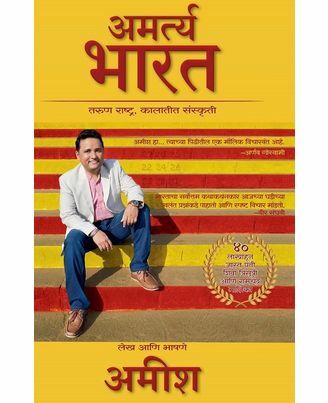 "Described as ‘India’s first literary popstar’ by world-renowned film director Shekhar Kapur, Amish’s unique combination of crackling story-telling, religious symbolism and profound philosophies have made him an overnight publishing phenomenon, with spiritual guru Deepak Chopra hailing Amish’s books as ‘archetypal and stirring’. Amish’s books include the Shiva Trilogy (The Immortals of Meluha (2010); The Secret of the Nagas (2011); The Oath of the Vayuputras (2013)) and the Ram Chandra Series (Scion of Ikshvaku (2015), Sita- Warrior of Mithila (2017)). His books have over 4 million copies in print with gross retail sales of over Rupees 120 crores. The Shiva Trilogy is the fastest selling book series in Indian publishing history. Scion of Ikshvaku, Book 1 of the Ram Chandra Series, was the highest selling book of 2015. Sita- Warrior of Mithila, Book 2 of the Ram Chandra Series, released little over a month back, is already the highest selling book of 2017. Amish’s books have been translated into 19 Indian and International languages. Amish has won various awards, including the Raymond Crossword Book Award 2015 for ‘Scion Of Ikshvaku’. Forbes Magazine has listed Amish amongst the 100 most influential celebrities in India. 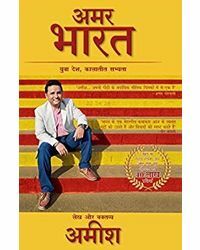 He has also received the Society Young Achievers Award for literature in 2013, Man of the Year by Radio City, Communicator of the Year by PR Council of India, Dainak Bhaskar Reader’s Choice Awards and Pride of India award (Literature). Amish was also selected as an Eisenhower Fellow, a prestigious American programme for outstanding leaders from around the world. Amish is a graduate of IIM-Calcutta and worked for 14 years in the financial services industry before turning to full-time writing. He lives in Mumbai with his wife Preeti and son Neel." 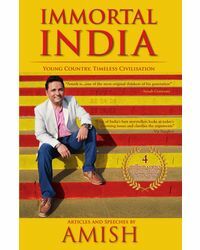 About the Book : "India… a young country, a timeless civilisation Explore it with India’s very own storyteller, Amish India, a culture that witnessed the dawn of civilisation. That witnessed the rise of other cultures and watched them turn to dust. It has been celebrated and attacked. Admired and vilified. But through all these millennia, after all the ups and downs of history, it’s still here! And now, after a few centuries of decline, it’s driving a new dawn once again. Ajanaabhavarsh. Bharat. Hindustan. India. The names may change, but the soul of this great land is immortal. Amish helps you understand India like never before, through a series of sharp articles, nuanced speeches and intelligent debates. Based on his deep understanding of subjects such as, religion, mythology, tradition, history, contemporary societal norms, governance, and ethics, Amish lays out the vast landscape of an ancient culture with a fascinatingly modern outlook." About the Author : "Described as ‘India’s first literary popstar’ by world-renowned film director Shekhar Kapur, Amish’s unique combination of crackling story-telling, religious symbolism and profound philosophies have made him an overnight publishing phenomenon, with spiritual guru Deepak Chopra hailing Amish’s books as ‘archetypal and stirring’. Amish’s books include the Shiva Trilogy (The Immortals of Meluha (2010); The Secret of the Nagas (2011); The Oath of the Vayuputras (2013)) and the Ram Chandra Series (Scion of Ikshvaku (2015), Sita- Warrior of Mithila (2017)). His books have over 4 million copies in print with gross retail sales of over Rupees 120 crores. The Shiva Trilogy is the fastest selling book series in Indian publishing history. Scion of Ikshvaku, Book 1 of the Ram Chandra Series, was the highest selling book of 2015. Sita- Warrior of Mithila, Book 2 of the Ram Chandra Series, released little over a month back, is already the highest selling book of 2017. Amish’s books have been translated into 19 Indian and International languages. Amish has won various awards, including the Raymond Crossword Book Award 2015 for ‘Scion Of Ikshvaku’. Forbes Magazine has listed Amish amongst the 100 most influential celebrities in India. He has also received the Society Young Achievers Award for literature in 2013, Man of the Year by Radio City, Communicator of the Year by PR Council of India, Dainak Bhaskar Reader’s Choice Awards and Pride of India award (Literature). Amish was also selected as an Eisenhower Fellow, a prestigious American programme for outstanding leaders from around the world. Amish is a graduate of IIM-Calcutta and worked for 14 years in the financial services industry before turning to full-time writing. He lives in Mumbai with his wife Preeti and son Neel."